Orkut is not dead yet (at least what it seems after seeing the data) but the social networking site is losing its visitors day by day. Still the domain is seeing 2.3 billion views per month from approximately 49 million unique visitors. But the future of Orkut is definitely not seems good as the popularity of Facebook, twitter and Google+ (Google Plus) is causing market loss to this Google’s first social networking site. Orkut and Google+ is owned by the same company, so you may expect smooth migration from older to the new platform, but the complete migration is not that smooth yet except photos migration. 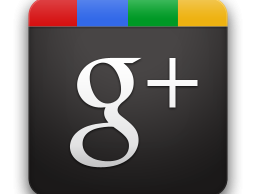 Yes, you can migrate the photos hosted on Orkut to Google+ with a single click and share them within your Google+ circle in no time. Those who are using Orkut since a long time, they may have lot many memories in form of pictures hosted on the social networking platform. Now if you are planning to move to Google+ which is having really cool features like hangout, you may consider taking those old pictures to the new platform as well. 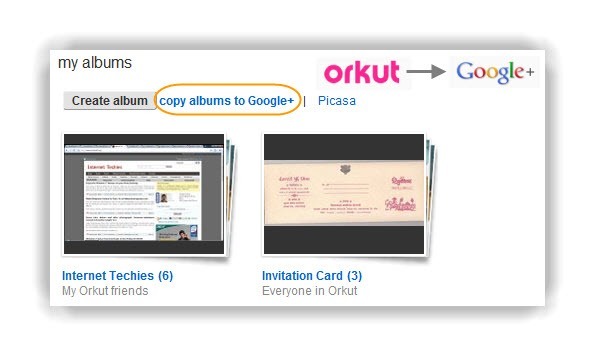 To copy the photo albums from Orkut to Google+, you just need to go to the “Photos” section on your Orkut account and click on “copy albums to Google+”. A new window will open where you need to select the albums that your want to copy from Orkut to Google+. Now hit the “Import Selected” button on that page, and your album will become available on Google+. It is easy to integrate Facebook and Orkut profiles but to migrate photos between two is not that easy yet. Earlier folks used to migrate data (including photos) from Orkut to Facebook using the FB application named Migrakut. But recently Google started blocking any third-party applications from accessing the Orkut data. Till any other option comes, you will have to individually copy the old photos from Orkut and upload that to Facebook to get them there. 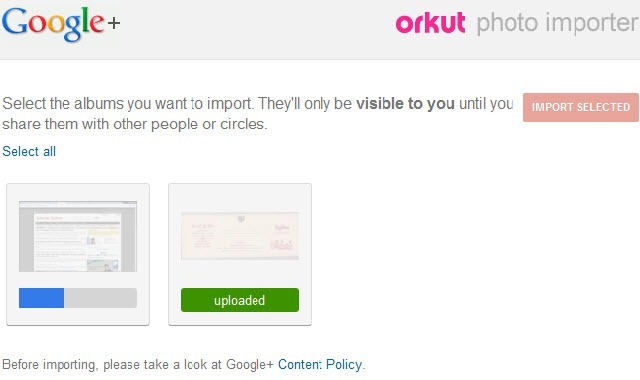 If you are aware of any other option to migrate photos from Orkut to Facebook, let us know through comments.